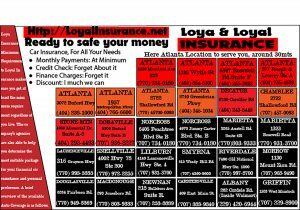 Auto insurance is obligatory in most states in the U.S. and Loya Insurance is a very suitable option. Everyone who drives a car has to own an insurance policy as proof of financial responsibility. In the past, most of the auto insurance companies did not sell directly to consumers. Nowadays many major insurers offer an online platform with which people can ask for a quote and purchase the insurance via Internet. This kind of modernization eliminates the needs for an agent or any third-party services. The new buy-and-sell model is right to improve customer experience, but some people still prefer the old-fashioned method. Loya Insurance company offers both models, allowing all types of consumers to get the coverage in a desirable way. Besides providing online quote service, Loya Insurance has more than 360 offices across the country. Most of the agencies are in California, Colorado, Illinois, New Mexico, Nevada, and Texas. One of the most remarkable things about this insurer is that the agencies are in public places where most people visit on a regular base such as grocery stores, supermarkets, street corners, office buildings, and shopping centers. Though you can also find Young America Insurance in those same places. It allows potential consumers to have direct communication with agents in almost all areas within the company’s range. The company’s advertising campaigns also use conventional media including radio, newspapers, yellow pages, billboards, and television. Types of auto coverage available from the company include liability and personal injury protection. There is also optional coverage such as MedPay, Collision, Comprehensive, and Uninsured Motorist. Every state has different regulations concerning auto insurance. To comply with the rules, you have to purchase at least the mandatory coverage. Loyal Insurance makes sure you get at least the minimum requirement regardless of where you live. The company’s agencies are also able to help you determine the most suitable package for your financial circumstance and personal preference. A brief overview of the available Auto Coverage is as follows. Bodily Injury: if you are at-fault in an accident, you are responsible for providing compensations for the injured party. Bodily Injury Coverage covers any medical cost required to treat the injuries up to the limit stated in the insurance policy. If the value exceeds the given limit, you have to pay out of your pocket. It is advisable to opt for a higher limit to minimize expense after an accident. Property Damage Liability: it is the same as a bodily injury, except the coverage that is to repair or replace the other party’s vehicle. In a car accident where you are liable, you have to pay the cost of repairing damages to the other party’s vehicle. It does not cover damages to your car even when you are not at-fault. It can be compulsory or elective depending on where you live. Loyal Insurance offers PIP to cover medical expenses to treat your injuries. If your passengers also suffer from injuries in the accident, PIP will cover the medical cost as well. Personal Injury Protection applies regardless of who is at fault in an accident. The best thing about PIP is that it compensates for income loss due to the crash. Loya Insurance calls it MedPay. Unlike PIP, it only covers the medical cost for your injuries. When PIP reaches its limit, MedPay kicks in and covers the remaining cost. It is good coverage, but you may need to talk with your insurance agents concerning the possibility to omit this coverage because you have a separate health insurance. If your existing health insurance covers the medical cost to treat any disease or injuries including accident-related cases, you may not need to purchase MedPay at all. To cover damages to your car, Loya Insurance offers two types of optional coverage including Collision and Comprehensive. Both of them cannot apply at the same time, but each is applicable regardless of who is at fault in an accident. Collision: any damages to your vehicle as a result of an accident or collision with another vehicle or object are within the protection of Collision Coverage. With this coverage, the company will pay the cost of repair or replacement. Comprehensive: in case damages to your car are results of non-collision or non-accident situations, the cost of repair and replacement is under the financial protection from Comprehensive Coverage. Insurance perils within the range of Comprehensive include theft, windstorms, vandalism, fire, falling objects, and contact with animals. Many repair shops are under Loyal Insurance Direct Repair Program. By fixing your car at one of those stores, you get immediate benefits that include a lifetime guarantee on repairs. Guarantee appeals for as long as you own the vehicle. Also, it applies to damages covered by one or more coverage in your policy. Damages as results of ordinary wear and tear or improper maintenance are not eligible for the benefits. In case your car needs to stay in the shop for few days or more, the insurer allows the approved stores to provide rental arrangements. Another thing that makes Loyal Insurance (or Loyola Insurance) different from most insurers is the fact that the business does not use credit history or driving records to determine approval and premium rate. Even when you have a driving record full of tickets or bad credit score, the company does not take those variables into account, so everyone has an equal chance of acquiring auto insurance regardless of financial conditions and driving habits.